Not everyone has a collection of priceless artworks in their home. However, increasingly people have a number of high value items - particularly electronics such as cameras, MP3 players and mobile phones - which would make an attractive and easily portable haul for any burglar. Whether an item is a piece of antique jewellery or the latest video MP3 player there is a lot that can, and should, be done to protect it. The best way to protect valuable property is to ensure that intruders cannot get in to steal it. 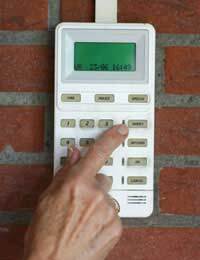 If a home is obviously secure a burglar is much less likely to risk trying to break in. Valuable items should not be advertised - a front room which can be seen by passers-by may look like a shop window to a passing thief. Marking items serves two purposes. Firstly, if an item is obviously marked it will be much more difficult for a thief or burglar to sell it on. Secondly, if stolen goods are recovered by the police they are much more likely to be returned to their owners if they are marked. Specialist systems for art/antiques - some companies offer a service which marks an item with a DNA, chemical or microdot system. People may prefer not to use an obviously visible method on a valuable item although this will have an additional deterrent effect. Some items may not be suitable for marking as it may diminish their value.Jewellery, art, antiques and other unusual or high value items should be photographed so that they can easily be identified if they are stolen. Such photographs can also be used for insurance purposes. For most people today the theft of a home computer would be far more devastating than the loss of just another expensive electronic item. Computers may contain anything from family photographs to bank account details. Many people now work from home and a computer may contain months or even years of work. The loss of this gold mine could easily lead to identity theft. It is vital that care is taken to use passwords that cannot easily be guessed as well as other security measures. Data should be backed up on a separate system and kept apart from the computer. Computers can be fixed to a table making it more difficult to remove them - laptops could be locked away when not in use. Once valuable items have been marked, photographed or otherwise identified a list should be made with a description of each item. Any serial numbers or unique identifying features should be noted. The list should be stored together with the photographs in a secure place. Money, important documents and small, high value items can all be kept in a safe. Preferably this should be wall-mounted or fixed in some other away. However, even if it is simply very heavy it may make a burglar think twice about trying to carry it away. Many safes are also fire-proof meaning that important documents left there will not be lost if there is a fire. The basic rule of thumb is that valuable items should never be left in unattended cars, or other vehicles. If there is no alternative but to leave an item in a car it should be kept out of view so that thieves are not tempted by it. All vehicles should be locked when they are left - even if it is only for a few minutes. It takes seconds to open a car door and grab a bag that has been left on the back seat. A thief will be more than willing to open an unlocked door, which will attract less attention than breaking a window. If the worst comes to the worst and somebody finds an intruder in their home they are entitled to use force to prevent their property from being stolen or damaged. However, this involves the obvious risk of injury - or worse - and householders should take all possible steps to prevent this situation arising in the first place.